The following cable modem buying guide will help you decide which modem you should choose as your network device. Learn about various factors like ISP (internet service provider) compatibility, modem channel bonding, and the modems to avoid when selecting the correct cable modem for you. First of all, you should consider ISP compatibility. When choosing the right cable modem, make sure your ISP has approved the modem for use on their network. Many people think any modem will work with their service provider. In most cases, this is not true, so use a certified modem (links to ISP approved modems listed below). Consider your internet speed. If your internet plan produces a 300 Mbps speed, an 8×4 channel modem (with a max theoretical speed of 343 Mbps or about 215 Mbps in actual speed) would not get you your full speed you are paying for with your ISP. However, a 16×4 channel modem (max theoretical speed of 686 Mbps or about 372 Mbps in actual speed) would allow you to achieve your full speed. Keep in mind, some internet service providers will increase your speed for free for various reasons. Even if your modem produces a faster speed than your internet plan (e.g. a DOCSIS 3.1 modem), future-proofing benefits you sooner or later. Read more below about advertised modem speeds. Many cable modems have Intel Puma 6 chipsets that have known issues with network latency and network jitter. You may read more about the issues on the Intel Puma 6 chipset defects page, which also contains the full bad modems list (the do not buy list). To indicate a bad modem, ApprovedModemList.com will mark an Intel Puma chipset modem with a ♦ symbol. Why Buy Your Own Cable Modem? The first reason to purchase your own modem is to save money. ISPs may charge up to $12 a month to rent one of their old modems. Therefore, you can save up to $144 a year on rental fees. Of course, those rental fees will continue to increase every year as well. After five years, you could save up to $720! Consequently, you can buy a modem for as low as $40 and use it for years. Reason #2 for buying your own device: you can pick which features you want in your modem, as opposed to the ISP forcing a limited features modem on you. Therefore, you have control over the brand, color, and specifications of the modem. Even though cable modem manufacturers state a certain speed on their boxes, those speeds are unobtainable. For example, the NETGEAR CM400 modem states a speed on the package up to 340 Mbps. However, ISPs will limit this speed for various reasons. Comcast states the CM400 will actually reach speeds up to 215 Mbps on their network. The speed you get will only be a certain percentage of the stated package specification. Why is that? Various factors like the type of server, total number of users on the network, computer equipment, services offered by the internet provider, and other factors will throttle the full output of your modem speed. Keep in mind that the stated data rate (download and upload speed) is just a maximum theoretical number. Even DOCSIS 3.1 modems may advertise speeds of 6 or 10 Gbps, however the ISPs will limit these cable modems to 1 Gbps due to network capabilities. When you see a modem with 16×4 channel bonding, that means it has 16 channels for downloading and 4 channels for uploading. The rule is simple – the more channels a modem has, the faster the data rates will be. So, a 16×4 channel modem achieves a faster data rate than an 8×4 channel modem. In other words, the more data channels your modem has, the more speed the ISP can push to your home (if you have purchased the fastest speed tier from your ISP). The chart below explains the speeds for each channel setting. ISPs use the data channels of the modem to deliver the internet to your home. The internet is like a highway and bottlenecks and slows during peak hours. However, having more lanes of traffic or data channels allows you to avoid congestion and keeps your full download speeds going. Data Over Cable Service Interface Specification (DOCSIS) allows for the transporting of data over a coaxial cable (internet service). The most widely used format by cable internet providers remains DOCSIS 3.0. Most ISPs support DOCSIS 3.1, although many neighborhoods may have to wait years before DOCSIS 3.1 capability reaches them. The main difference between DOCSIS 3.0 and 3.1 is the capable speeds. Comcast states that a DOCSIS 3.0 32×8 channel modem will reach actual speeds of about 650 to 700 Mbps on their network. While a DOCSIS 3.1 32×8 channel modem will achieve a speed of 1000 Mbps or 1 Gbps. You will see at least a 30% speed boost over the older technology, if the ISP offers gigabit internet. DOCSIS 3.1 features backwards compatibility with a DOCSIS 3.0 network. So, if your ISP has not yet upgraded to DOCSIS 3.1, a DOCSIS 3.1 modem will still function on a DOCSIS 3.0 network. Many network devices classify as combo units. In other words, a cable modem and a WiFi router combined into one device. The list below contains the pros and cons of these devices. Consequently, it is usually cheaper and easier to upgrade modems and routers separately. DSL technology is older and slower. Most DSL providers are not in a hurry to upgrade their phone lines. If you have a choice of internet service providers, choose a cable internet company. A select few cable modems are capable of reaching speeds of 1000 Mbps (or 1 Gbps). DSL cannot compete with the ultra fast speeds of cable internet (or fiber internet). Modems require little care. The most important thing to remember is that cable modems can get really warm. Do not block the vents on the cable modem. Also, make sure you have enough ventilation circulating around the device. Finally, do not leave modems near heat sources. Your modem should function properly without any other maintenance (other than occasionally dusting the device). Cable modems come from several manufacturers, but the most popular ones are ARRIS, NETGEAR, TP-Link, Motorola, and Linksys. If you are looking for a company to support your device for the next several years, those mentioned earlier are your best bets. Warranties will range from one-year to two-years from the modem manufacturers. You will know in the first few hours of operation if your modem works. Cable modems rarely fail as long as they do not get too hot. Also, if you buy a new modem from Amazon, they will offer an inexpensive extended warranty (usually about $2 to add three or four-year coverage). To help you decide which cable modem to choose, please follow the three steps at the top of this page. With the many options for modems, reviewing your ISP approved modems page may help with deciding which modem is right for you. 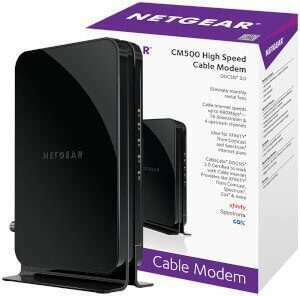 The best value cable modem today belongs to the NETGEAR CM500, which most major ISPs support.